Company F activated to Mexican border in 1916. Activated again in 1917 for Federal service in World War One. Deactivated in 1919, returned to National Guard status at the Armory. December 23, 1940 activated for one year into Federal service as Company A 182nd Infantry ,26th ( Yankee) Division. Stationed at Camp Edwards for training. December 7, 1941 Pearl Harbor, war is declared. Federal service was now for the duration of the war. January 1942 Company A and the rest of the 182nd Infantry detached from the 26th( Yankee) Division. January 23 ,1942 sailed from New York to the Pacific. All units of the 182nd Infantry were then attached to a new Division named Americal. 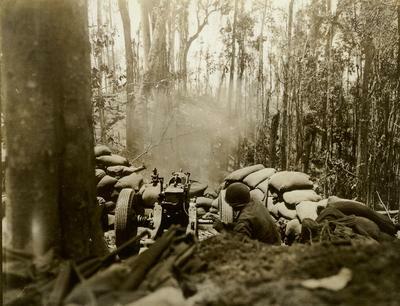 The 182nd as part of the Americal Division entered combat along with US Marines at Guadalcanal. The unit then fought at Bougainville Island for approximately one year. The unit went on to fight at Cebu and Leyte Islands of the Philippine Islands. August 1945 Company A entered Japan as an occupational force. December 1945,Company A returned home and was deactivated from Federal service.